Gloucester VA Links and News: Gloucester, VA Old Page Middle School Site, What Should We Do With It? There are a lot of questions being asked about what we should do with the old Page Middle School site. Ideas have ranged from yet another community park to a community recreation center, a place to institute a new multi garage and repair center for the county and school board vehicles to selling the property to a commercial developer. Here is something to consider, it's got plenty of land and space for building what the county could really use. A living museum. Yes, we already have a museum. A very tiny one. Not a living one. The county is always looking for ways to promote tourism and trying to figure out how to get more of the tourist dollars that go to other areas such as Jamestown, Yorktown and of course the big one, Williamsburg. Those are areas with very rich histories. Looking at the entire scope of history however, Gloucester ranks right up there with these other locations. Our history is no less remarkable and we just do not take advantage of it the way we should. In the past, because of it's location, Gloucester was not a solid contender for being added to the list of joining Jamestown and Yorktown in crafting plans for promoting history and tourism. Gloucester lacked a solid way to come into the county. Today that simply isn't the case with a 4 lane bridge connecting us to those major centers. Gloucester lacks promotions of Pocahontas, Powhatan, Tobacco plantations, indentured servant uprisings, Bacon's rebellion, Battle of the Hook, Rosewell, Walter Reed birthplace and the first shots fired in Virginia during the American Civil War and the list is much larger than this. Gloucester history is American History and we sit on it doing very little to promote and take advantage of it. Look across the river and watch as Yorktown continues to grow along with the new major museum being built there. A well planned living museum could do massive wonders for this community. Gloucester does not lack historians with an incredible knowledge of this area's history by any means. 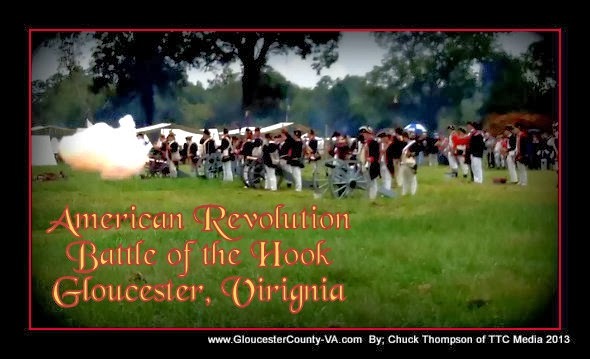 Warren Deal and the entire team that put together the Battle of the Hook event back in October did one of the most spectacular jobs anyone could ever begin to imagine. The educational value would also be a incredible blessing. We would happily donate all we could to the concept. If Gloucester is to grow into the future, our leaders need to start looking at what is needed to make that happen in a well structured way that will benefit the community. Are we to just sit on our history and let it rot never to take advantage of its opportunities? If we wait for some company to come in and take advantage of our history, well we have already been doing that and it has gotten us nowhere. It's time to be proactive. A new and properly planned living museum could bring in some very much needed tourist dollars and also enhance area education. It's a win win situation. In fact, it's Revolutionary.